Burzum is the musical project by Varg Vikernes (under the pseudonym "Count Grishnackh"). It began during 1991 in Bergen, Norway and quickly became prominent within the early Norwegian black metal scene. During 1992 and 1993, Burzum recorded four albums; however, in 1993 Vikernes was convicted and imprisoned for the murder of guitarist Øystein "Euronymous" Aarseth and the arson of several churches. While imprisoned, Vikernes recorded two albums in the dark ambient style. From 1989, Vikernes had been playing in the short lived band Old Funeral which also consisted of members who would later form the band Immortal. He played guitar in the band until 1991 when he left to form his one man band, Burzum. Soon after recording two demo tapes, he became very involved with the Norwegian black metal scene, being both interested in its music and the ideology. With his demo tapes, he had attracted attention from Øystein Aarseth of Mayhem, who had just recently formed Deathlike Silence Productions. Aarseth then signed Burzum to the label, and shortly after, Burzum began to record for his self-titled debut album. According to Vikernes' autobiography on his website, he had intended to record the album in the worst recording quality possible (due to this being a typical trademark of the early Norwegian black metal scene), though still make it sound acceptable. Burzum's eponymous debut album was released in 1992, being the second album released on Deathlike Silence Productions. The song "War" from this album had a guest appearance from Euronymous of Mayhem, playing a guitar solo "just for fun", according to Vikernes. 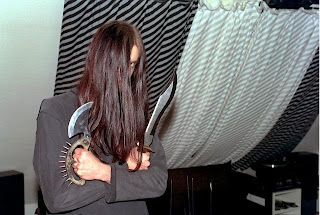 Vikernes has stated that he had never played any live shows with Burzum, though at one point was interested in it so Samoth of Emperor joined the band as their bassist though only appeared on the Aske EP. Additionally, Erik Lancelot was hired to be the band's drummer, though did not record on any Burzum material, and along with Samoth did not play a live show. Vikernes had by then lost his interest in playing live concerts, and stated that he "didn't even need session musicians anymore". Therefore, Samoth and Lancelot had parted ways with Burzum. Burzum stayed as a solo project until 1993, when Vikernes was arrested for the murder of Euronymous and the burnings of several churches in Norway. Det som engang var was released as Burzum's second album in 1993, recorded in 1992, and was the first of the remaining albums to be released during his incarceration. Vikernes was in prison for the murder of Euronymous, former guitarist of Mayhem, as well as the arson of several churches in Norway. During his time in prison, Vikernes has recorded two albums in a dark ambient style. They were released as Dauði baldrs (1997) and Hliðskjálf (1999). Vikernes has already written eleven new tracks, nine metal tracks and an ambient intro and outro for an upcoming Burzum album, which he hopes to release around March or April 2010. Vikernes mentions that several record companies are interested in releasing his first album in eleven years. He has stated about the new album, "I want to take my time, and make it the way I want it. It will be metal, and the fans can expect genuine Burzum." The album was going to be originally titled "Den hvite guden" (The White God), but he later decided to change it to "Belus", which will be released by "Byelobog productions".